Everyone knows Netflix, the online streaming service where users can watch films, documentaries and TV series online 24/7. Netflix has over 100 million subscribers globally, and they all expect the service to work flawlessly and provide first-class user experience and content each and every time. To be able to meet users’ expectations the service must be resistant to failure and it must adapt to changing demand quickly and automatically. Technically, this is a huge challenge to any information system – especially when we’re talking about over 100 million users. Of course, the most important thing to the users is high-quality content. World class technical solutions and architecture mean nothing if a service does not provide interesting and meaningful content to its users. When it comes to delivering the content to the users, technical solutions and architecture are key enablers, and without those it is not possible to get access to it or the user experience is poor. Great technical solutions are transparent to their users – the users don’t even know that they’re there. Netflix has been able to meet the expectations well. At the same time they’ve managed to keep the underlying architecture fully transparent to users – as it should be. Netflix has built the underlying system so that it is highly available, fault tolerant, resilient and scalable. One of the key factors in their success lies in the architectural choices. Instead of building one monolithic system, Netflix has built its system around multiple loosely coupled services. This approach is called microservice architecture. Another key factor in Netflix’s technical success is the use of cloud services. 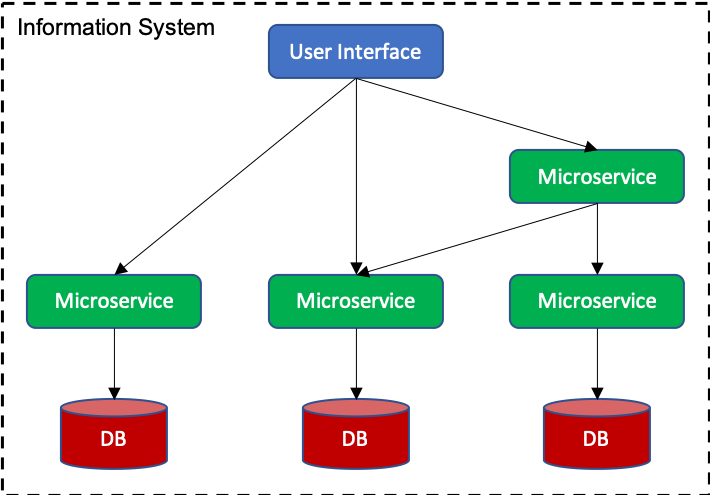 Microservice architecture pattern is one of the most commonly used architecture patterns in the recent years. It is based on the idea that a system is composed of multiple small, independently deployable and loosely coupled services that communicate with each other using language-agnostic APIs. Usually the services are organized around business capabilities. Each service can be developed and deployed independently of one another which simplifies the development and deployment of large, complex applications as each part of the application can be developed and deployed independently instead of deploying the whole application every time when a single component is updated. On the other hand, microservice architecture also increases the complexity of a system. The complexity comes from multiple fine-grained services operating together seamlessly. A single business feature may span multiple microservices which requires an additional layer for coordination and orchestration, service discovery, error handling etc. Locating a malfunctioning component from such a system is not a trivial task. In addition, each service can be developed independently, but testing of a business feature requires that all the related services or their mock versions are available. At this point you might be wondering what all this has to do with X-Road? Keep on reading, you will find it out soon. X-Road is an open source data exchange layer solution that enables organizations to exchange information over the Internet. X-Road is a centrally managed distributed data exchange layer between information systems that provides a standardized and secure way to produce and consume services. X-Road ensures confidentiality, integrity and interoperability between data exchange parties. The data is always exchanged directly between a service consumer and a service provider, and no third parties have access to it. X-Road is not based on microservice architecture, but the X-Road ecosystem shares many of the same characteristics – on a higher level, though. Instead of a single information system consisting of multiple small atomic services, X-Road is a data exchange layer between service consumers and business services provided by various information systems owned by different organisations. The services available via X-Road are independently deployable and loosely coupled, and they communicate with each other using language-agnostic APIs. Each service can be developed, deployed and scaled independently without affecting other services as long as the API remains unchanged. Sounds familiar? However, X-Road is just a data exchange layer – an enabler for secure and standardized data exchange that is transparent to end-users. Just like microservice architecture is enabler for building scalable, fault-tolerant and highly-available systems. The real value comes from services that are built on top of the technical infrastructure and the content that they provide to users. X-Road enables citizens, entrepreneurs and officials to operate via different portals and applications (document management systems, institutional information systems) in a more efficient and flexible manner. For example, it helps checking for relevant information in various base registries or securely exchange documents between organisations. X-Road is used nationwide in the Estonian data exchange layer X-tee and in the Suomi.fi Data Exchange Layer service in Finland. Both Estonia and Finland have their own state portals that provide users access to different public registers and services. In general, a state portal is a single point-of-entry to public services for citizens, entrepreneurs and officials. X-Road is used in the background to connect the portal to different information systems and registers maintained by various organizations. Instead of going through websites and portals of different authorities one by one, there’s one centralized place to search and access services. Image 2. A state portal connected to various information systems and base registers via X-Road. A state portal is a Netflix of public services. It is a centralized place that gives 24/7 access to public services provided by different authorities. It is a platform that citizens can use to communicate with different authorities, and search, access and update information. New services are added to the platform and old ones are removed. Also the platform itself is constantly developed based on the feedback received from users. X-Road is a transparent data exchange layer in the background that enables secure and standardized data exchange between the portal and various information systems and base registers. X-Road plays a key role in the architecture, but the most important thing is the actual content – what would be the value of Netflix without all films, documentaries, TV series etc.? The same goes with a state portal, it’s all about the available content and services.